In verse 7 ages is plural, so it refers to both the coming age and eternity. Thus, verse 7 tells us something about New Jerusalem. This verse says God will display. New Jerusalem will be a display of the unlimited riches of God. Verse 7 also uses the word surpassing. It does not tell us what will be surpassed but the whole of Ephesians presents an unlimited Triune God. What He will display will surpass everything we have seen or imagined. Then the word riches. It is plural. 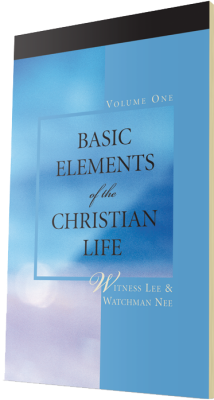 God is not merely rich in grace; His grace has multiple aspects of richness. How many aspects we cannot guess. 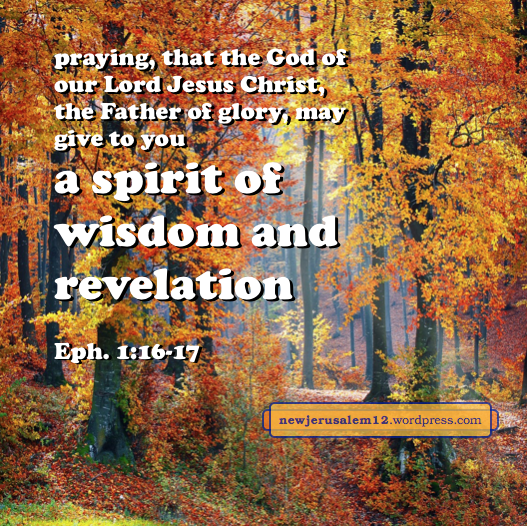 Even now we can receive “grace upon grace” (John 1:16)—grace in multiple layers. 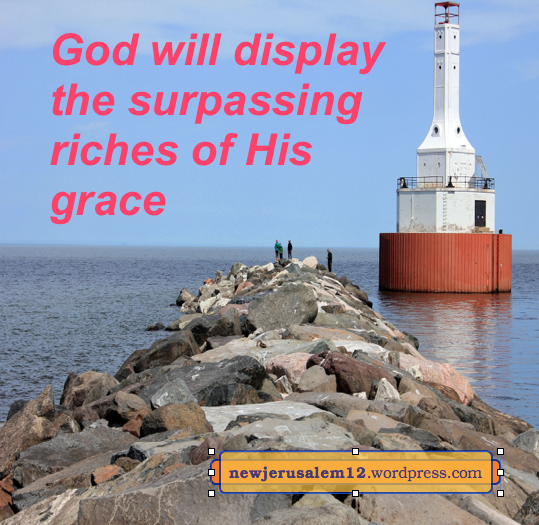 The surpassing riches are of His grace. This grace comes to us in Christ Jesus and is Christ Jesus Himself (John 1:14, 17). This grace comes in kindness. We do not deserve the surpassing riches of His grace, but because God loves us and is merciful to us, this grace abounds to us. Thank Him for His great mercy! This surpassingly rich grace comes to us in Christ Jesus. He is the realm for all God’s blessings to us. All the surpassing riches of New Jerusalem will be in Him and displayed through Him. This is the next verse of a song about Christ’s love for the church as His wife. This love extends to New Jerusalem, His eternal wife. It begins with mercy and love. 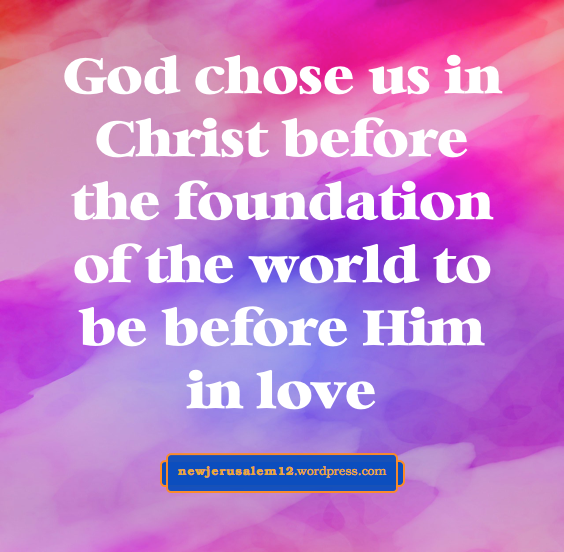 Ephesians 2:1-3 speaks of our fallen condition but 2:4 declares the contrast, “God, being rich in mercy, because of His great love with which He loved us.” Through mercy and love, God made us alive together with Christ and raised us up together with Him. 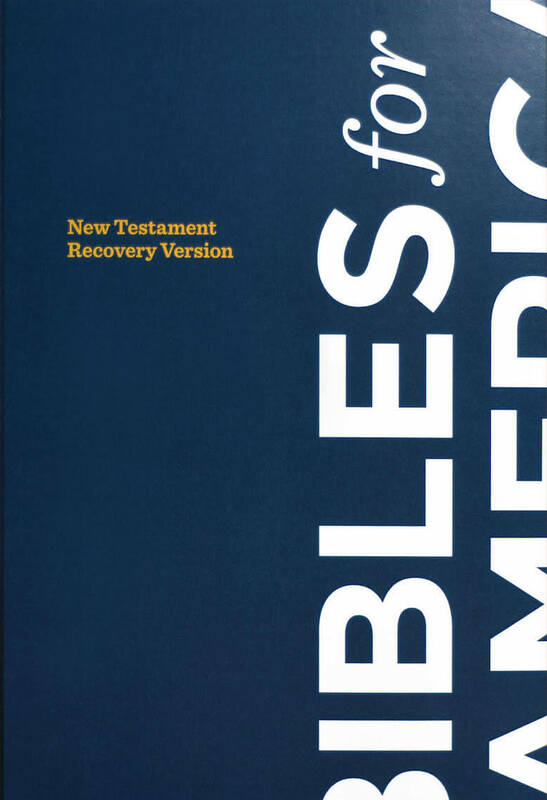 Ephesians 2:7 tells us that God’s desire is that “He might display in the ages to come the surpassing riches of His grace in kindness toward us in Christ Jesus.” The ability to produce this display out of our fallen condition manifests God’s unsurpassed wisdom and is through His grace, both mentioned in the verse and the song. Certainly we can sense the love of God and must thank Him for this love, yet we are limited. 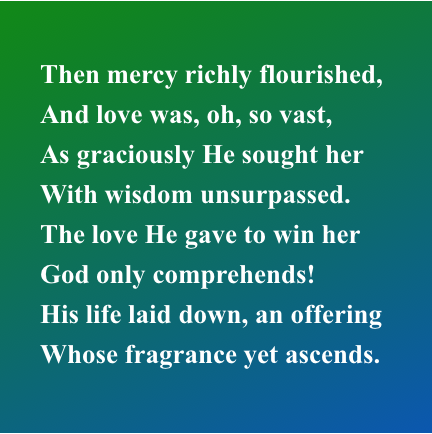 We should expect, as in the song, that the fulness of this love is only comprehended by God. The fragrance at the end is clearly typified by the fragrance of the offerings in Leviticus and implied by the Father’s word “This is My Son, the Beloved, in whom I have found My delight” (Matt. 3:17). 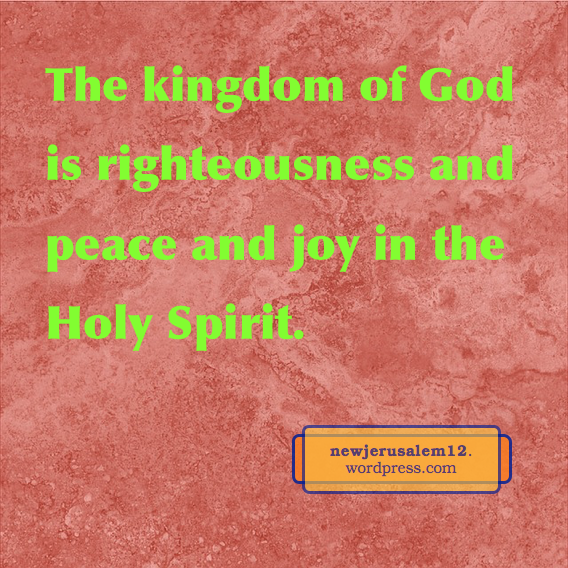 The gospel of the glory of God points to New Jerusalem. So does “the gospel of peace” because Jerusalem means The Foundation of Peace. Acts 10:36 speaks of “the gospel of peace through Jesus Christ (this One is Lord of all).” Jesus Christ “Himself is our peace” because on the cross He terminated all the divisive factors which cause enmity among mankind (Eph. 2:13-16). In resurrection He came as the Spirit in his disciples and “announced peace as the gospel to you who were far off [non-Jews], and peace to those who were near [Jews].” This peace is for today and for eternity. 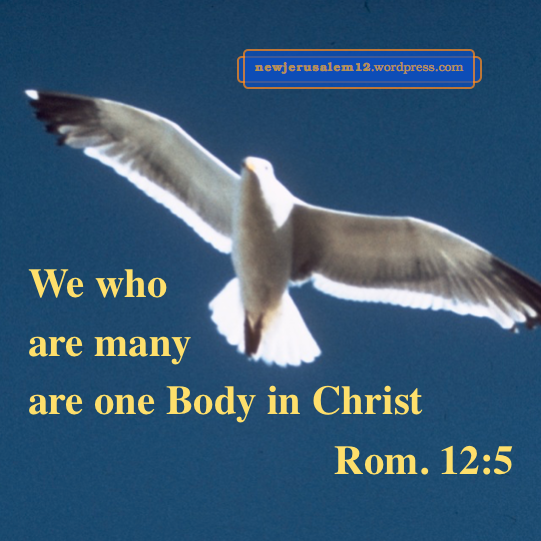 In Christ we have the present reality of no divisive ordinances or feelings. 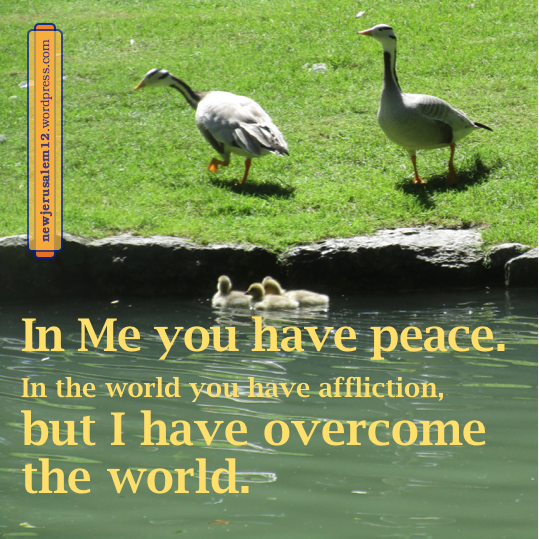 “In Me you may have peace. In the world you have affliction, but take courage; I have overcome the world” (John 16:33). Eventually the world and all its divisive factors will go to the lake of fire, so the new creation, with New Jerusalem as its center, will be 100 percent peaceful. Today, while the world is still around us and we walk through it, we should have on our feet “ the firm foundation of the gospel of peace” (Eph. 6:15). This foundation both separates us from the world and supplies us to speak the gospel of peace to others. 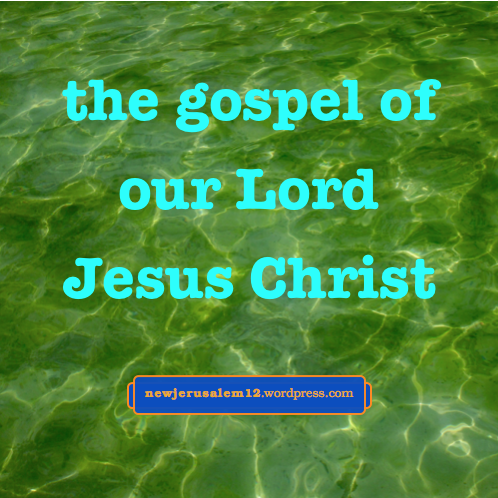 This gospel of peace is our present foretaste of New Jerusalem. God created the earth for His purpose. Through all His operation in time, God will gain the new earth with New Jerusalem for eternity. But, God did not create the world and there will be no world in eternity! Because the world is negative, it needs to be judged. 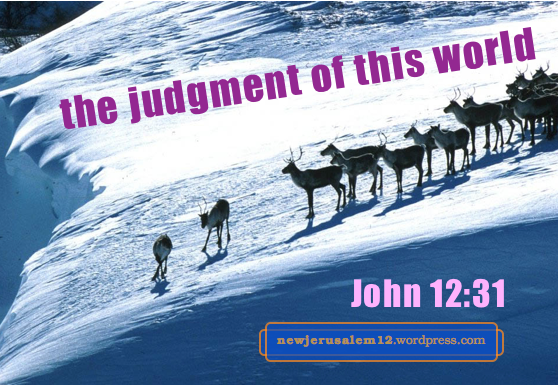 Jesus, looking forward to His crucifixion, said, “Now is the judgment of this world; now shall the ruler of this world be cast out” (John 12:31). Therefore, we can boast in “the cross of our Lord Jesus Christ, through whom the world has been crucified to me and I to the world” (Gal. 6:14). Jesus said, “My kingdom is not of this world” and by His cross we have been separated from the world. But before believing and receiving Christ Jesus and all He accomplished, we “once walked according to the age of this world” and were people “having no hope and without God in the world” (Eph. 2:2, 12). But now, in Christ, we have God and we have hope, even the hope of glory, the hope of participating in New Jerusalem. Through His death and resurrection we have been transferred from the world to God’s purpose for the earth with New Jerusalem as the goal. New Jerusalem is the consummation of the Lord’s redeeming work on the cross, the Lord’s sanctifying/purifying work now, and His glorifying work at His return. We see New Jerusalem by being carried away in spirit (out of the natural realm) onto a great and high mountain (above the level of our ordinary living). To consider Revelation 21–22 as something natural is to miss the reality presented here. This is to repeat the error common in John’s gospel—interpreting or trying to grasp the Lord’s spiritual presentation by natural understanding. Here are more examples of this. • In 6:51-55 no one understood how the Lord could give us His flesh to eat for eternal life. But He spoke of the Spirit who gives life (v. 63). • In 8:32-34 He spoke about being free from the slavery of sin but the hearers thought only about human slavery. • In 8:51-53 the Lord spoke about keeping His word to overcome eternal death but the hearers could only think of physical death. • In 11:11-14 the Lord used sleep as a picture of death; the disciples thought of physical sleep and could not comprehend His word. • In 14:7-11 the Lord told the disciples that they had seen the Father manifested in His living and doing, but they only thought of physical seeing. 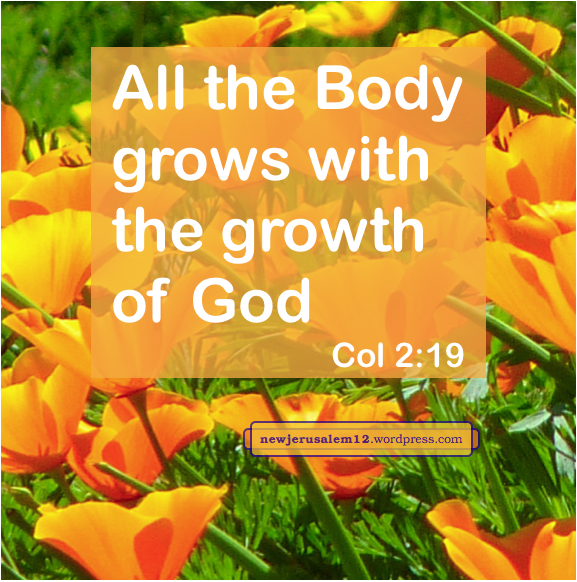 New Jerusalem is the consummation of the church as the Body of Christ, His fullness (Eph. 1:22-23). 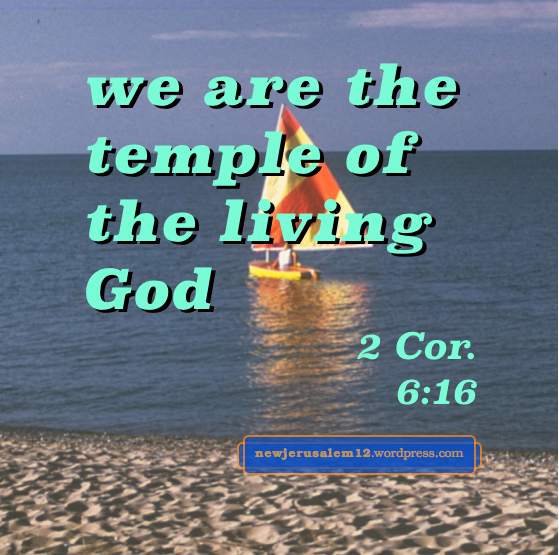 New Jerusalem is also the consummation of the new man created by Christ in Himself (Eph 2:15), the holy temple growing in Him (2:21), and the dwelling place of God in spirit (2:22). Surely this is not in the natural realm. Lord, carry me away in spirit to see New Jerusalem!